NOTE: These come on a strip and must be cut before applying. Polyester uniforms and athletic materials are not receptive to ink or adhesive. For these items, you can trim your Iron-On labels and iron them directly onto the clothing tag. Designer Iron Ons are our newest labeling solution. Use these labels on almost any clothing item! They work especially well on items without a tag, such as socks and T-shirts. The layout of your label will vary based on the design and text selections. Place label text side up on the fabric. Pre-heat iron for 5 min. on high setting - no steam. Press with very firm stationary pressure for 10 sec. You're done! Tell all your friends how easy that was! *i.e., phone number or email. The layout of your label will vary based on design and text selections. 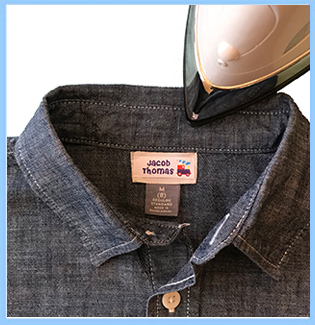 Our iron-on labels are easy to apply and laundry-safe. They are ultra-durable yet very comfortable. They are perfect for socks, undergarments and tagless t-shirts. These personalized name labels work great at camp, school, daycare and nursing homes.